Nutrichoice-like badam milk digestives :) Low saturated fat, no white sugar, no maida How many nutrichoice digestives fans here? I got a request from a friend to come up with an alternative to nutrichoice badam milk cookies. I requested her to share the ingredient list, since I no longer buy market junk and then planned my own choice of ingredients to come up with something similar. 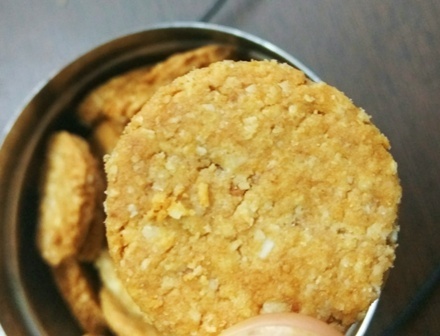 To my surprise, everyone in the family simply fell in love with these milk badam digestives. I hope I have done justice to the recipe. How many likes for nutrichoice digestives? What if I say I have come closer to imitating the milk badam digestives from Britannia's nutrichoice? No, I have not tasted the packed biscuits, but I feel I have come closer to the recipe to recreate my own milk badam digestives. This is a nutritious cookie with fiber rich oats and bran. 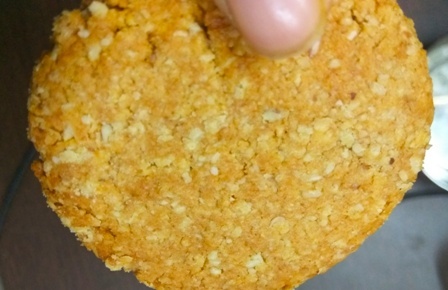 If you have tried my other digestives recipes and liked them, then you already know that this will be a hit in your home, because we have followed the same process and made a few inclusions here and there to give these a nutrichoice-like feel. As you can see in all of my digestives recipes, we begin with collecting the dry ingredients in a bowl. Make sure you sieve the dry ingredients well, so that baking soda is evenly distributed. When I say dry ingredients, this includes whole wheat flour or atta, oats powder, milk powder, bran, badam powder, raw cane sugar powder and baking soda. Since almond powder and bran are coarse, they may not pass through the sieve completely. Worry not! Sift everything together and then mix all the coarse contents that remain in the sifter. Next comes the mixing stage - yes, we will be mixing the liquid ingredients. Here, you should take a small bowl and mix milk and honey. Whisk both and keep aside. Add cold ghee and oil to the flour. Rub the ghee into the flour unless you get a wet/sticky bread crumb-like texture. If your flour doesn't give you a wetty look, you may add another teaspoon of oil/ghee. I didn't feel the need to add more :) But some types of flours absorb more, so you may add an extra teaspoon or tablespoon, whatever fits your needs. Next add the milk-honey mix to the bread crumb-like flour. Gather the ingredients into a ball. DO NOT KNEAD. NEVER KNEAD ANY OF MY COOKIE DOUGH. YOU WILL NOT GET THE BEST RESULTS. Does the flour come together as a ball or log? IF so, your nutrichoice digestive dough is ready. Roll the dough like a thick (1/4 inch) chapati - not too thick nor too thin. Take a cap/bangle or cookie cutter to cut shapes. Prick each cookie with a fork if you want to. I did this for half the batch. Place the cookies on a baking tray and refrigerate for 20-30 mts. This will prevent them from expanding in the oven. You may go ahead and bake them right away too. Your choice. I refrigerated half the dough. Preheat the oven/mw convection to 160 degrees for 10 minutes. I have airfried the digestives. Preheat the airfryer to 160 degrees for 5 mts. Bake/airfry the badam milk digestives for 12-15 mts at 160 degrees. Check if the edges have browned by then. If not, you may bake them for a couple of minutes extra. The cookies may still look soft when you take them out of the oven, worry not. These will get crunchier as they cool. Allow the digestives to cool down before storing in an airtight container. Do give this airfryer cookie recipe a try. Disclaimer: I do not buy biscuits so try to come up with my own cookie recipes, for this is a healthier alternative to market stuff. Thank you, Poonam. I am sure you'll love the nutrichoice-like almond milk digestives.